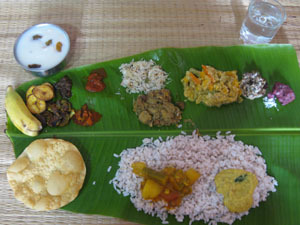 Mulakooshyam is quite a popular dish in my part of Kerala. This is a kind of medicinal recipe as it is mostly prepared when somebody is down with fever or cold. Hot kanji and a bowl of mulakooshyam can definitely tickle your taste buds even while sick. The main ingredient is pepper, fish tamarind is added for sourness and you can use yam or raw banana for this recipe. One of my friends shared the recipe for Trissur style mulakooshyam which is entirely different from this one. I will share that recipe sometime. This tasty mulakooshyam is really easy to prepare and it goes well with rice / kanji. 1. Soak the kudam puli pieces in warm water for 10 minutes. Tear into small pieces. 2. Cut the raw banana, to medium-sized cubes, into a vessel filled with water. Drain the water before adding to the gravy. 3. Crush the whole pepper corns in a mixer. Add pearl onion and garlic. Grind everything to a coarse mixture. 4. Heat a cheena chatti / pan at lmedium-low heat. Add chilly powder and coriander powder. Stir for 2 – 3 minutes continuously and add the coarse mixture mentioned above. Saute until the water is evaporated. Add around 1.5 cups of water, kudam puli pieces, few curry leaves, enough salt and bring to a boil. Add the raw plantain cubes. Cook covered for about 15 – 20 minutes at medium heat until the raw banana cubes are fully done and the gravy is thick. Add coconut oil and a few curry leaves. Close with the lid and keep aside for 15 minutes. Serve hot with rice / kanji. Replace kudampuli (cocums) with tamarind if you are using yam. super…i have never had it before…must try it out soon.. nice clicks too…waiting for ur other recipe too. Beautiful clicks..Looks so perfect and awesome…very healthy dish too. Love the last picture, the consistency looks so nice. Kaya mulakooshyam adipoli, choru koodi kittiyal mathi. This is new for me. Thanks for the adipoli recipe..
new recipe but look so delicious. In our side we dont add Puli while making mulakoshyam ..Good one !! Never had this before.Looks so delicious. wow, that looks so tempting, seriously. I can simply have that thali with rice and curry, amazing. Is the coconut oil to put after all is done. The coconut oil needs to be added after everything is done (that is when the curry is fully cooked and the gravy is thick). We need to cook the onion masala and dry powder mixture until the water that comes out of the mixture completely evaporates. It wouldnt take more than 2-3 minutes for the mixture to get dry. Hope this helps. Good luck!! Yey it came awesome!Bless u for that. can v add the onion, pepper corns n garlic without grinding it? will it taste the same? The taste won’t be same if you do not grind them coarsely. Hi, maya.. I tried kaya mulakooshyam.. It came out well, looks exactly like the picture..
You’re welcome! Will pass your comment to my mom 🙂 Really glad that it came out well. Had raw onion taste to it. What did I do wrong here. Also the amount of puli wasnt enough. You can add more kudampuli, if the puli isnt enough. If you saute the ground onion mixture well, you wont have the raw onion taste. Also saute it immediately after grinding, otherwise onion will taste bitter. do we need to pour the puli water or discard it? This recipe turned out really bad. I followed it step by step. Turned out to be really bitter/pungent from the shallots. Was barely edible! Hi Maya, I once had this style of molagooshyam and fell head over heels with it. What other veg can u make it with? In palakkad it is made very bland. Kind of got tired of it. They make all types of mulagooshyam in palakkad. With cheera, muringa ila, ashgourd, pumpkin, wonder if those might work with ur style. Thanks for ur wonderful recipes!